Something huge happened two days before the first Rock the Bells tour stop in Chicago, transforming the festival into a day-long mourning experience that I hadn’t experienced before at a music festival. From the stage to the lawn seats, the death of Michael Jackson completely altered the entire emotional experience for both the fans and the artists. Even though we were all gathered to enjoy the beats and rhymes of hip hop’s finest, Jackson’s death hung like a shadow over the event as the distant look of nostalgic sadness and heartfelt loss was painted on fans’ faces. The impact of Jackson’s music on hip hop culture was felt throughout the day as his hits pumped from the speakers in-between sets, and as artists — in one way or another — paid tribute to the King of Pop. His music has influenced all genres, but his impact on, and his own love for, hip hop culture was a pivotal part of his live performance. The moonwalk’s roots can be traced back to the pop-and-locking done by the b-boy crews that rose up in the early ’80s in California and New York, a dancing style that developed years before Jackson unleashed his own version. I didn’t see anybody moonwalking on stage or in the crowd, but the influence of Jackson’s music was undeniable from the moment I walked into the First Midwest Bank Amphitheatre. While the MJ tributes flowed from the stage, I grappled with another sad truth about Rock the Bells 2009. I let my perpetual optimism fool me into thinking that I could expect a lot of progressiveness from this annual festival. But sadly this year’s edition wasn’t a very accurate representation of the kind of hip hop that Live Nation and Rock the Bells founder Chang Weisberg of Guerilla Union promoted in the festival press releases. It’s nice that the intention was there, but how can you have a “premier” hip hop festival without b-boys, or at least a stronger focus on hip hop culture itself? This was the first stop of the tour, and there might’ve been some difficulty in getting other artists that are a better representation of hip hop’s present, but I wonder if it was just me and my high expectations for hip hop culture, or if this was the best that hip hop has to offer in 2009. As I walked around the grounds during the festival my heart mostly sat in a lukewarm state because what I was seeing was that hip hop culture (at least in the mainstream) is in a very strange spot in 2009. Hopefully it will figure itself out. Fortunately it has some willing leaders in stalwart emcee KRS-ONE, up and coming Somalian-born rapper K’NAAN, poet/emcee Sage Francis, and the recently reunited, reinspired and reenergized Reflection Eternal (Talib Kweli & Hi-Tec). On the main stage, sets were limited to just 15 minutes, so performances by New Orleans duo The KNUX, Jurassic 5’s emcee Chali 2NA, and rapper Tech N9ne felt rushed. The KNUX provided some welcomed funk and freshness, but struggled to find the groove to fill the three-quarters empty amphitheatre with their seething blend of soul, rap, and rock. With what little time he had, Chali 2NA leaned back and fired out a strong stream of songs from his upcoming album Fish Out of Water. Tech N9ne and his crew squeezed in a set packed with theatrics, complete with painted faces and matching red hospital scrubs, brilliantly mixing Motown choreography, turntablism and the synchronized stomp of step crew. The flaw of festivals like Rock the Bells is that just when a set is heating up, it’s time for the last song and then on to the next act. I feel sorry for artists who can’t adapt to this kind of schedule and I feel even worse for the fans who pay money to see artists struggle more than perform. MJ tributes rolled on with the Wu Tang’s Reakwon, who took a break in the middle of his set to share a Jackson tribute (and to promote his new video game) yelling emphatically, “No joke, ya’ll. I know that Michael Jackson was bigger than Elvis!” Reflection Eternal’s Talib Kweli swapped verses from the playfully deviant party anthem “Get ‘Em High” for freestyled rhymes dedicated to Jackson and Farrah Fawcett. At the second stage in the Temple of Hip Hop tent I soaked up one of the festival’s only showings of hip hop’s visual element. Artists from local organization Popmurals.com created live graffiti artwork representing some of their efforts to bring life and creativity to the darker and dirtier parts of Chicago’s inner city. After scoping out the visuals, I was ready for poet/emcee Sage Francis. He riled up the crowd using controversial current events, citing an incident involving the Chicago police beating a woman at a local bar. Francis’s set never cooled off. He charged into his usual spitfire spoken-word wizardry, serving up stinging tracks “House of Bees” and “Needle” from his latest album/mixtape Sick of Wasting. Back on the main stage, Somalian-born emcee K’NAAN, backed by a full band, slapped a conga and savored the moment as he wrapped his arms around the crowd during the reflective easy-going ballad “Take A Minute.” K’NAAN’s frame might be small, but his heart and message are massive. He uniquely melds African folk, reggae, old and new school hip hop to tell gritty journalistic stories of growing up in war-torn Somalia. In an unexpected move, he ended his set with an a capella crowd sing-a-long about his family history. It seemed like an odd choice for a live show — I expected something from either his sophomore album, Troubadour (2009) or his debut, Dusty Foot Philosopher (2005). Despite being the festival’s host and one of hip hop’s best emcees, KRS-ONE’s set was brief. He primed the crowd with a hip hop history lesson in “Rap vs. Hip Hop” and spliced in other tracks from his up-coming album Survival Skills. 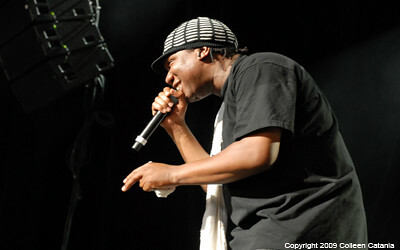 I also felt a bit of jealousy and admiration when my wife Colleen (who was taking photos in the pit) told me she became a part of KRS-ONE’s freestyle rhyme after he worked in the string of photographers in front of him to finish up his spontaneous last verse. When the sheets of rain began to pelt my face around nine I knew my adventure was almost over. The Roots fought through a set riddled with sound issues but still induced awe and wonder as expected. Yet neither Busta Rhymes’ belly flop of a set or the disappointing and scattered headlining duo of Nas & Damian Marley — who were touring in support of their upcoming collaboration album Distant Relatives — could elevate Rock the Bells to the height it should have reached. Fans came to celebrate and get energized by the beats and rhymes, but much of the festival’s emotional energy stemmed from Michael Jackson’s death. It was a new feeling for me as a live music fan, and it was the first time that I had shared the mourning experience with such a large group of music fans. Jackson’s impact on hip hop is undeniable. Is Michael Jackson’s Death His Final Gift To All Live Music Fans?